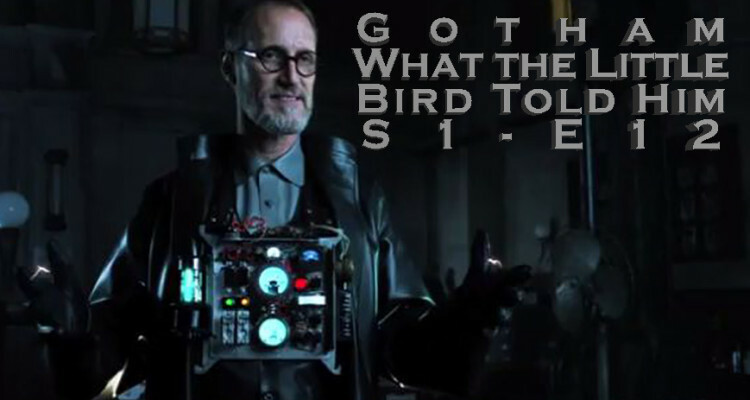 Continuing on with the story in Gotham: The Soap Opera, What the Little Bird Told Him starts with Jim Gordon making his way tentatively back to the GCPD by convincing the current police commissioner that he is the only person who can catch the escaped Aaron Helzinger, and Jack Gruber (now being referred to as the Electrocutioner as we speculated in the review of episode 11, Rogues Gallery). 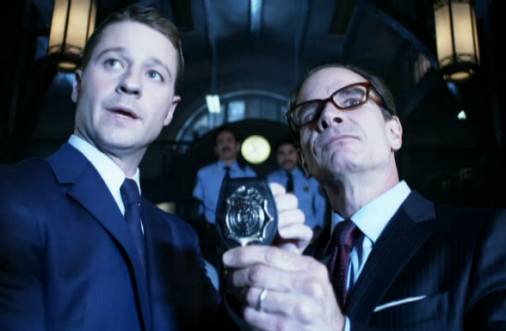 Gordon is allowed to take the case, and has 24 hours to bring Gruber in if he wants to be a detective again, otherwise him and Bullock will both be on guard duty in Arkham. Bullock and Gordon find out that Gruber has been using an alias, and originally went to prison for a bank robbery. His accomplices were never found. Gordon suspects the one of the accomplices is Maroni. 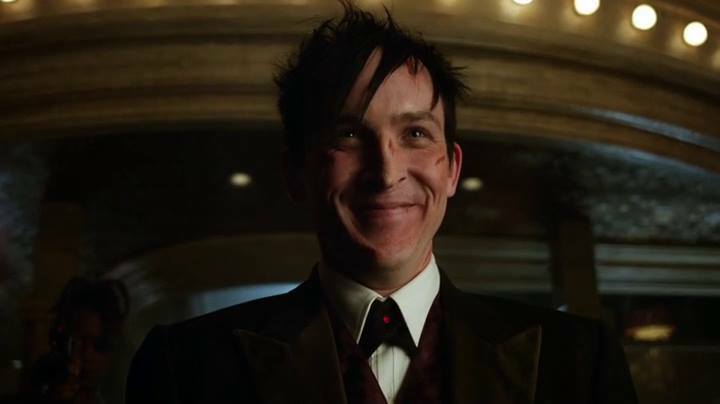 Gruber gets to Maroni first (knocking the Penguin out), but Maroni survives this initial attempt. Gordon convinces Maroni to go into protective custody, so Gordon can lure Gruber to the GCPD building. The plan works, and Gruber is caught. As far as a “villain of the week” Electrocutioner isn’t that bad. This part of the story was actually very enjoyable, and it’s only flaw was that it was cut too short to make room for all the other season arc that had to be crammed into the episode. Catwoman and Poison Ivy were missing, as was Bruce and Alfred. I am sure this is only because there was no room to cram anything with them in it. Although, either of their stories would have been better then having to watch Barbara have tea with her parents. Fish moves forward with her plan to dethrone Don Falcone by staging Liza’s kidnapping. 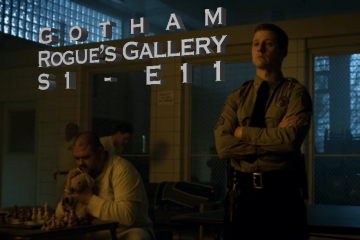 Way to much time is spent on this stoyline, but I am dealing with it in hopes that these new developments will lead to the end of Fish Mooney. Her story is awful, and needs to be removed from Gotham as soon as possible. 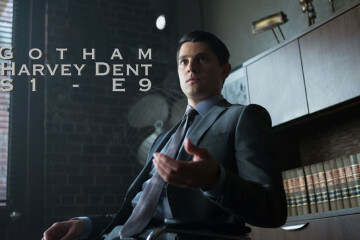 Falcone figures out that Fish is behind the kidnapping all by himself, but it takes the Penguin to clue him in that Liza was a plant to begin with. Penguin has trouble getting to Falcone because he keeps getting knocked out by the Electrocutioners high voltage toys, and somehow ends up with a lot of cuts from electricity. Victor Zsasz is back as one of Falcone’s cronies. 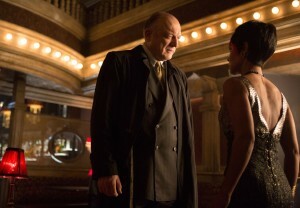 Once Falcone knows what is up, him and Zsasz take out most of Fish’s crew, and capture her. Falcone strangles Liza just to emphasize his distaste for people using his mother to get to him. There also seems to be a bit of a romance between Gordon and Dr. Thompkins striking up, and Ed Nygma seems to be striking out with his romantic advance toward Kristen Kringle. There may have been some other superfluous story line in here as well, but if there was, it was absolutely forgettable..